Those special tax assessments in Tamarac are now history. TAMARAC - City officials made a quick U-turn on their ambitious Main Street project Tuesday, backing off a plan to make some property owners pay hundreds of thousands of dollars to help pave the way for a swanky development. In doing so, the city dodged a tough court challenge as well as the wrath of a public outraged over what it saw as an unfair tax on 14 property owners. The city wanted property owners along Northwest 57th Street to foot the bill for improvements needed for its Main Street development there. The $8.8 million project will feature villas, high-end retail shops, fountains, towers and street scaping intended to revitalize the area. The property owners, who the city said would benefit from the development, were to be taxed anywhere from $1,707 to almost $1.5 million. But on Tuesday, the City Commission voted unanimously — with Commissioner Ed Porter absent and out of town — to drop the tax plan. In its resolution abandoning the tax, the commission said "public comments and concerns of affected property owners" factored into the decision. 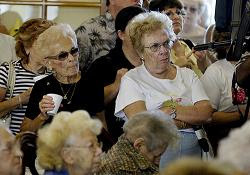 From the pictures on television and newspapers, it looked like a bunch of angry seniors had something to do with it. Haven't seen the walker and cane crowd so worked up since the restaurants in Boca Raton stopped putting out packets of sugar. The battle isn't over yet. City spokesman Andy Berns said the Main Street project remains a priority. "City staff will now explore all options for the funding of infrastructure necessary for this future project, while maintaining sensitivity toward the needs of our entire community," he said in a statement. The City Commission will look for another avenue to raise the money for redevelopment. If the people in Tamarac are smart, they'll give the entire City Commission the boot at the next election. With the exception of Commissioner Ed Porter, they're nothing more than a bunch of goniffs.